Willing to wait for a winner! The line of folks trying Wolf Bay Lodge’s oysters looked like this all day. 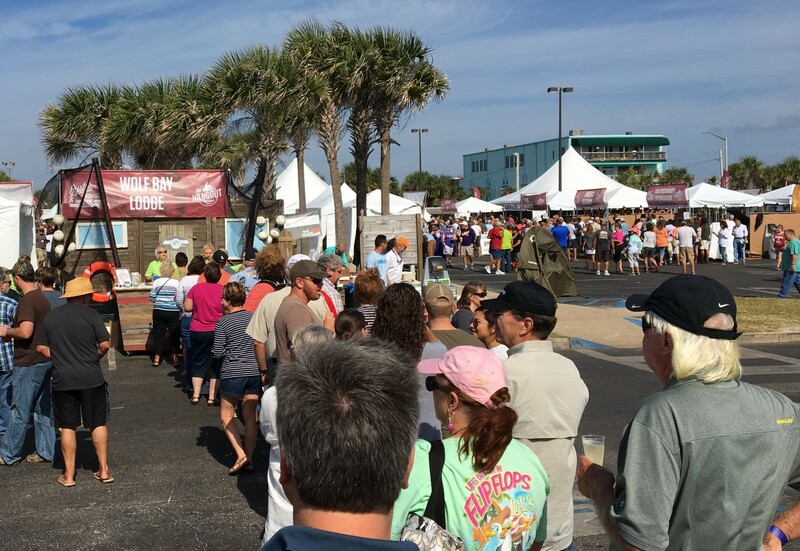 On the first weekend of November at The Hangout in Gulf Shores, Alabama, dozens of talented chefs prepare what is surely the world’s largest concentration of original oyster dishes. A few thousand oyster-lovers and a panel of judges get to choose the Hangout Oyster Cook-Off Winners. 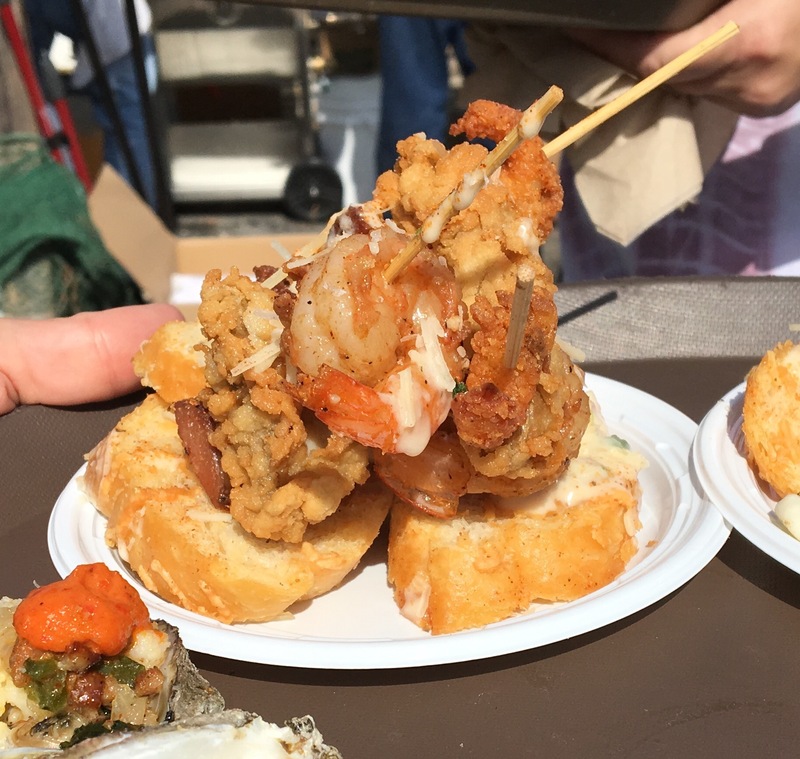 At the 2016 Hangout Oyster Cook-Off, there were 117 oyster variations competing for the top prize (and nearly a dozen more served by chefs presenting on Martie Duncan’s demonstration stage)! Competing restaurants each prepared a version of oysters Rockefeller, Cajun oysters, and a raw oyster topping. Festival attendees voted for their favorite oysters and a jury of chefs, oyster experts and journalists¹ chose winners from the top six oysters in each category. The Wolf Bay Lodge team (Foley and Orange Beach, AL) won People’s Choice and Best Overall for their Cajun oyster. Chef Ron Stone and the Wolf Bay Lodge team (Foley and Orange Beach, AL) won People’s Choice and Best Overall for their Cajun oyster interpretation. The rules define “Gulf Coast Cajun” oysters as the team’s take on Cajun flavor from the Gulf Coast (meat, cheeses, and spices are encouraged). Wolf Bay Lodge skewered a fried oyster with shrimp, crawfish tail, bacon, anchored the whole thing in crostini and drizzled it with Cajun Monica sauce. The line at the Wolf Bay Lodge booth speaks for itself! Beach House Kitchen (Gulf Shores, AL) won the Cajun category. The Beach House Kitchen team (Gulf Shores, AL) won the Cajun category with a Chargrilled Oyster Topped with White Cheddar Grits, Onion and Jalapeno Saute, and Andouille, plus a Habanero and Garlic Drizzle. Driftwood Bar & Grille (Orange Beach, AL) won the Rockefeller category. 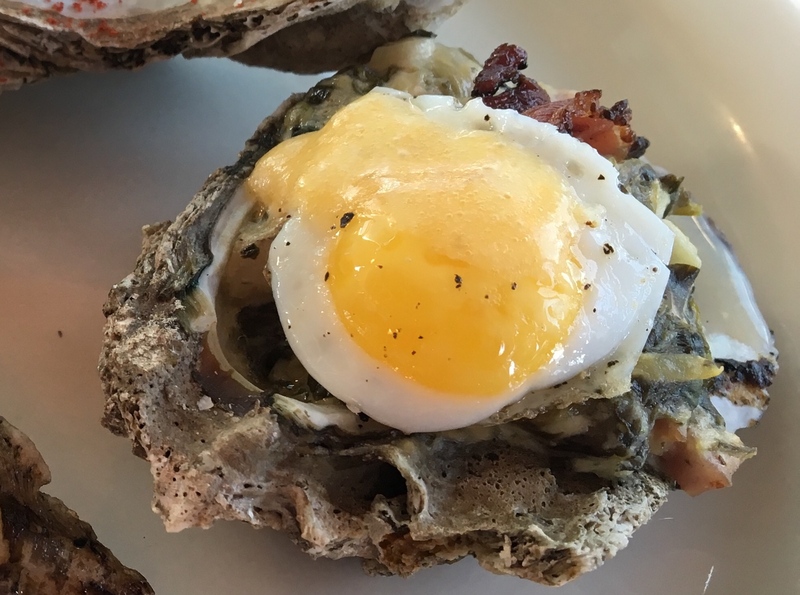 Driftwood Bar & Grille (Orange Beach, AL) won the Rockefeller category with their Oyster Sardou inspired creation: Grilled Oyster Stuffed with an Artichoke, Spinach, and Smoked Cream Cheese Sauce, then Topped with Cherrywood Smoked Wild Boar Bacon, Hollandaise, and a Fried Quail Egg. 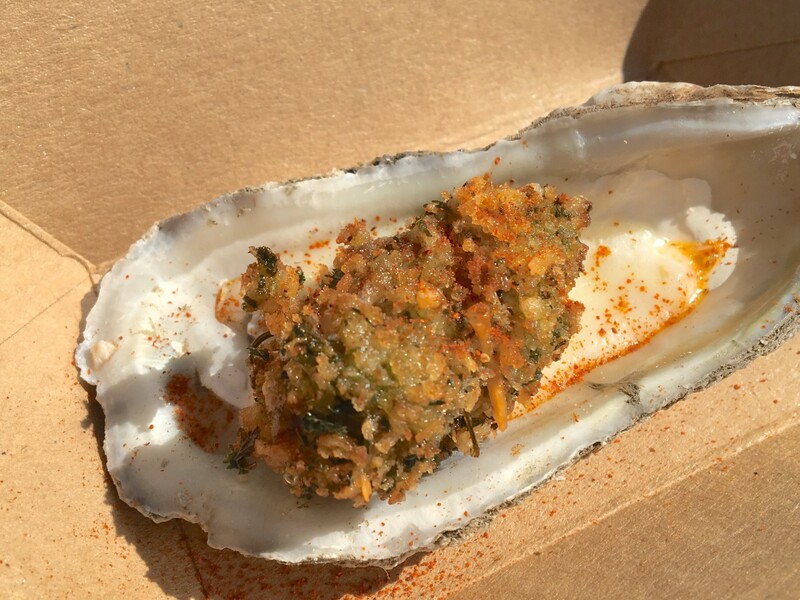 Alabama Oyster with Pumpkin Kimchi and Chicken Skin Furikake from Saltine. 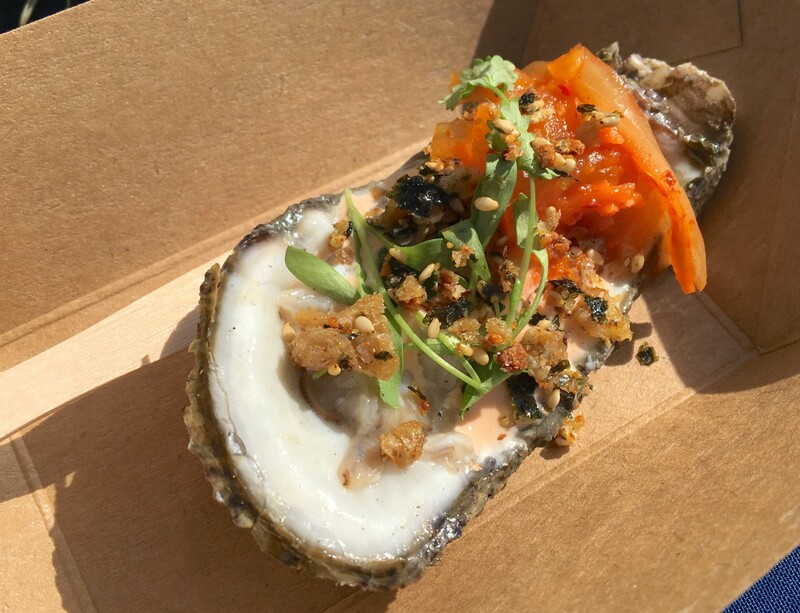 Chef Jesse Houston and the team from Saltine Restaurant (Jackson, MS) created an incredible topping, Alabama Oyster with Pumpkin Kimchi and Chicken Skin Furikake², winning the raw category. The Mississippi Seafood team won Chef’s Choice and the Rockefeller category. 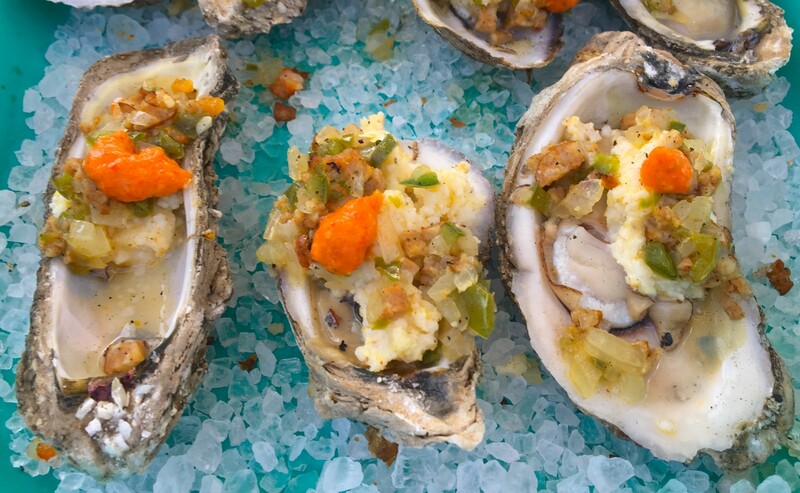 The Mississippi Seafood team won Chef’s Choice with chef David Crews’ extraordinary take on Oysters Rockefeller. Get this description: Confit of Garlic and Anise Infused Fondue, Oyster Dipped in Emulsified Buttermilk with Onion, Garlic and Spinach, Rolled in Panko Seasoned with Dehydrated Spinach and Parsely. That bite of oyster is worth every word! ¹Full disclosure: Oyster Obsession founder, Jason Burnett, was a judge. ²Within minutes of publishing, two friends asked, what the hell is “furikake?” Furikake is a Japanese seasoning commonly sprinkled on top of foods. It is usually made of dried, ground fish, sesame seeds, seaweed and other flavorings. Find oyster celebrations near you! We’ve rounded up scores of oyster festivals and events from coast to coast and around the globe.